My Ugly Dorothy is having a sale ! 60% off on many skin (320L$)! No end date yet, so don’t forget to take a look ! My best friend Mala called me “Chameleon” one day, because I always change my style, and I’m rarely recognizable. I kept that nickname. 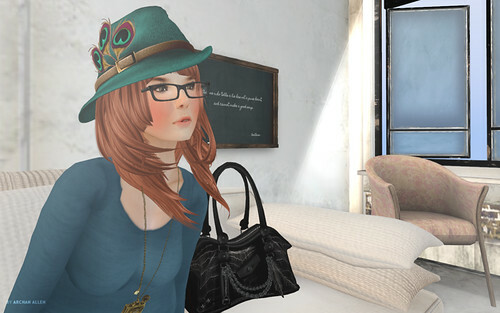 And today I discover this cute Chameleon hat from Kari ! What a surprise ! I had to buy it and wear it immediately ! 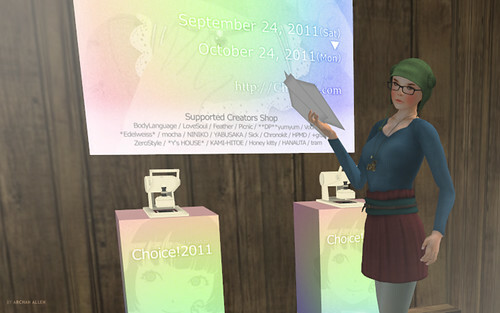 Choice 2011 has begun on september 24th and will end on october 24th ! Amazing gifts to grab ! Collect the stamps and validate your cards ! Here are the instructions if you don’t know this event (formerly known as CSR, Creators Stamp Rally). I collected the stamps for 4 cards this year. According to me, the prizes are less interesting, except the ones I choose to get. I used to get all prizes in the past years ! So here are the prizes I wanted !